Saturday was a day for birding. After looking for winter gulls along the Mohawk River upstream from its confluence with the Hudson and not finding any except a single Iceland Gull just west of where Route 9 goes over the Mohawk. I decided to try Fort Edward, not for the Short-eared Owls that were so numerous last year but for the Snowy Owl that has been reported off-and-on and was most recently reported on Friday. I didn’t find it. I did, however, have a pleasant couple of hours driving the back roads around the snow-covered farms and grasslands of Fort Edward. Two Red-tailed Hawks, three Rough-legged Hawks, and one Northern Harrier were all nice to see but were also all distant. On occasion, as I drove down the road a flock of something would take off from the shoulders and either disperse into the bushes or fly off the road. 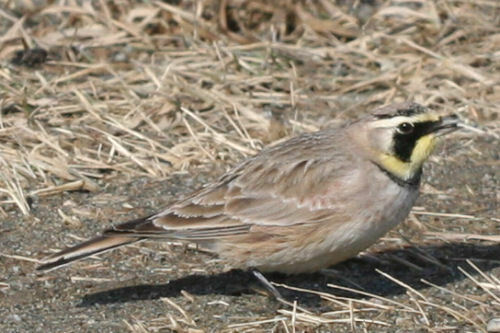 Sometimes, the birds were Dark-eyed Juncos or American Tree Sparrows, but more often they were Horned Larks. 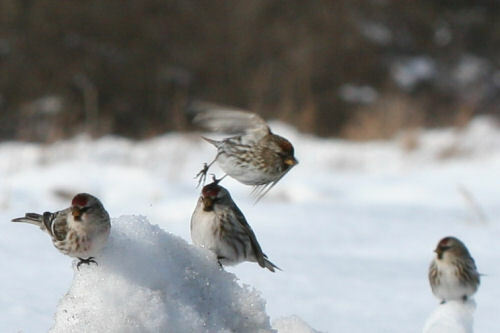 Even better was the one flock of about 35 Common Redpolls that I encountered twice. The first time they took flight when I drove slowly up to them but they landed a bit up the road. I parked, watched them grit for a bit, and then tried to drive past them. They kept flying up ahead of the car and landing. Eventually they flew off the road and circled back to where they were to begin with, which reminded me of how Belted Kingfishers will reverse course when they reach the end of their territory along a stream. The second time I encountered the redpolls I parked as far over on the shoulder as I could get when I was still well short of them and waited for another car to go past. When it did, they flew down the road towards me and decided to land in the snow bank across the street. Nice! Then another car went past and they landed behind me. I looked in the rear-view mirror and saw that one was larger and whiter than the others. I quickly contorted my body around and stuck my head out the window, almost dropping my binoculars in my haste. This was going to be my life Hoary Redpoll! And it was bigger and whiter than the Common Redpolls, mostly because it was a Snow Bunting, a male, on his way into breeding plumage. Nonetheless, it was a fun couple hours of birding. I’m going to miss the open country upstate when I move to the city so any time I spend out in it is time well-spent. 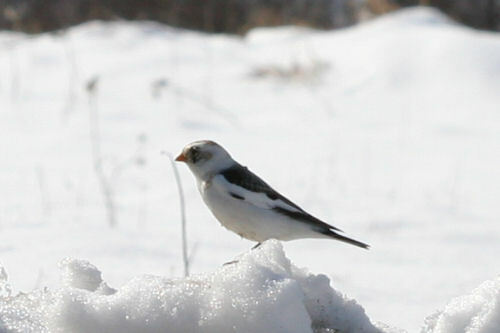 Even if Snowy Owls and Hoary Redpolls don’t decide to appear. Looks like such a wonderful birding day for sure! 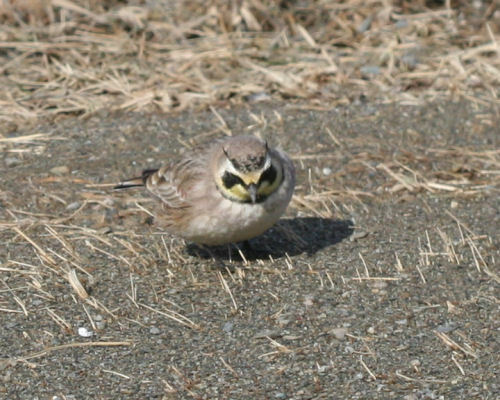 Love your photos and I have yet to get a great shot of a horned lark! So, bravo for such a great capture! Nice pictures! Too bad you dipped on the SNOW, but it looks like you got some other sweet stuff.